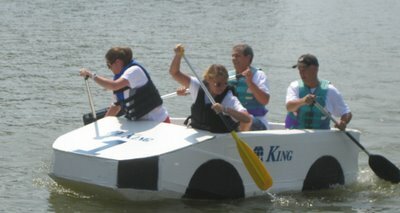 Saturday was the annual running of the cardboard boats at Pell City's Lakeside Park. Here is the first of a few pictures. The King crew did well, winning against two other teams. Looks like a barrell of laughs. We have similar events here in Melbourne. how many years has this been an event? i don't remember that from my time there. looks like they have a lot more fun in pell these days! It was all in fun. Thanks for checking in. marie, I think this is the second year. I'm not sure, I never made it before.